For at-home functionality and comfort choose the Salem Grand Villa destination trailer by Forest River for your new home-away-from-home. 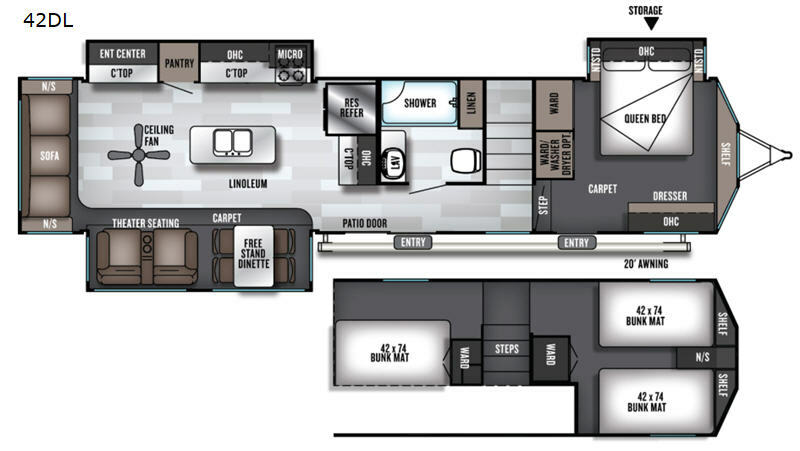 This destination trailer provides you living accommodations no matter where you choose. You will love the tall ceiling height, extra large windows for a great view in multiple directions, and plenty of space throughout. When you are inside, you will find complete amenities including a great kitchen featuring a residential refrigerator, a walk-in pantry, and large kitchen island with a solid surface countertop. There are ample storage cabinets and drawers for all of your things, plus the island also features additional storage as well. The living area is also quite functional with a 50" HDTV, theater seating, and an extra wide 80" sofa for relaxing after a fun-filled day outdoors. When it's time to retire for the evening, you will appreciate the spacious bath with walk-in shower, quiet master bedroom with private entry, and plenty of storage. The upper loft area features three bunk mats for extra sleeping, or this can become attic storage instead. So, for functionality and comfort when away from home, the Salem Grand Villa is your perfect choice!